What makes a colour beautiful? The answer is a bit deeper than first glance. Similarly with our emotions, it is not always the bright, shiny ones that of the most value, or even the most beautiful. As some of you may know my original training was as an artist (which I still practice actively), and I often think about the development of the mind, emotion and consciousness in terms of colour and texture. One of the observations that I have taken from my work as a painter is that whether a colour is beautiful or ugly, harmonious or jarring has as much to do with the colours next to it as the colour itself. For example we may think of grey as a very plain boring (even depressing) colour; but if you watch the way a grey sky can give depth and vibrancy to the green leaves of a tree, or give new definition to the foam on the waves of the sea, then we start to realize that grey has its place. Similarly the dark browns and blacks of soil give background to the beauty of vibrantly coloured flowers, the early nights and darkness of the winter evenings gives context to the vibrancy and buzz of the long sunny summer ones. As a painter if you can grasp this concept, then you will become a much better painter; you will get to know your greys and blacks and browns s well as your yellows, oranges and bright blues. You will understand how to put them together in your picture to produce a beauty that has true depth, texture and nuance. 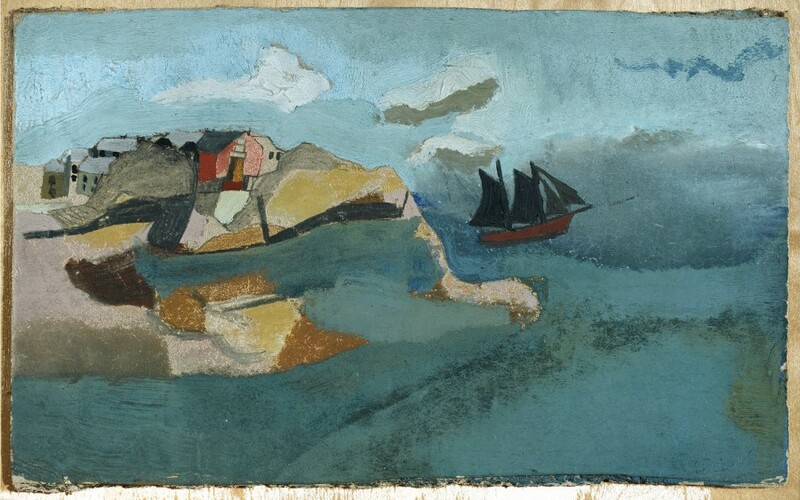 You can see the first picture I have posted with this article by Ben Nicholson above (one of my favourites) that shows a good example of this in a sea landscape. The greys, blues and blacks provide a context for the brighter yellows, blues and reds to come alive. 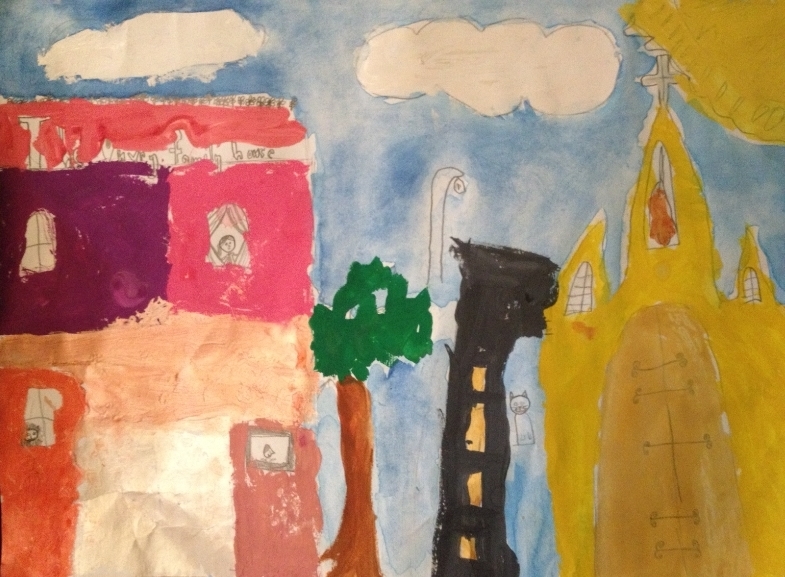 The second picture below is a cityscape by my daughter Sasha. I think you can really see in this one how the dark grey building in the center really gives substance to the bright yellow and pink buildings on either side. Without the grey the bright colours would look anaemic. So, when we think about the landscape of our emotions, it can be wise to get to know the grey, brown and black ones as well as the bright cheery, pretty ones. If we are prepared to look at them all together, without favoring one over the other, we may discover that each emotion, the sad ones as well as the happy ones all have their place in our life, all have their own beauty, and their own gifts to offer us. As a mindfulness or meditation practitioner, it can be a nice exercise to simply sit and open to our emotions and moods, benevolently embracing them all as we find them, and then consciously learning to wisely weave them into a beautiful painting (or song) each day, a painting that includes browns, blacks and greys as well as red, yellow and blue. Categorized under: creative imagery, Inner vision, Integral Meditation, Meditating on the Self, Meditation and Art, Meditation and Psychology, Meditation techniques, Mindful Resilience, Mindfulness, Presence and being present, Shadow meditation. Tagged with: Art and meditation, art and mindfulness, awareness, consciousness, inner growth, insight, integral meditation, integral meditation asia, integrated awareness, meditation in singapore, mindfulness, relaxation, stress relief, uniting mind and feelings.